I was finally able to see The Hobbit: The Desolation of Smaug for a second time, and I have to admit it was better watching it again. Whether that was because I knew what would happen so the disappointment/annoyance wasn’t fresh, or I was able to focus on the elements that I did enjoy since I’d already cataloged the things I didn’t like, I don’t know. And I did notice a few new things that I didn’t like. But I don’t want to let my first reaction to the movie be my last post about it, because I neglected to include any of the things that I did like about the film in that post, and there were some really great moments. 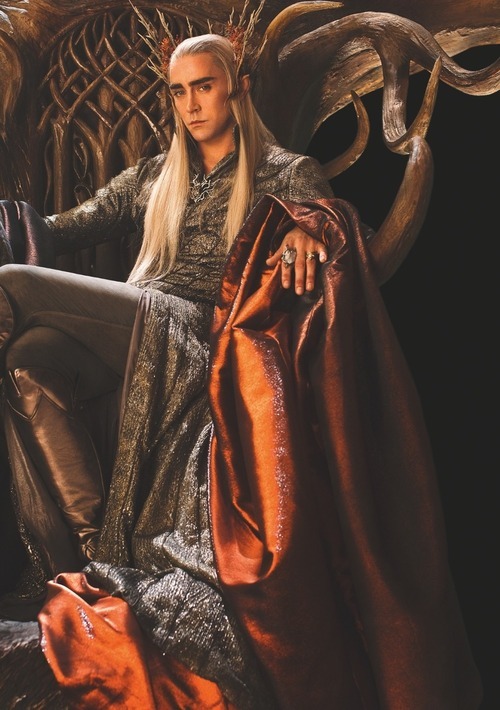 Thranduil is PERFECT, though. He might be my favorite thing about this movie. I know I already said that but it was just doubly reinforced watching his scenes a second time. He’s majestic and petty and knowledgeable but sassy and selfish and beautiful. Smaug looks great, too. If you just skip over the whole video-game-sequence, dwarves-running-around-easily-distracting-Smaug-and-then-stupidly-trying-to-melt-a-FIRE-BREATHING-DRAGON-(and-by-the-way-what-in-the-world-is-that-wheelbarrow-made-of-that-it-doesn’t-melt-when-Thorin-rides-it-in-a-river-of-molten-gold?) part, all the rest of Smaug’s screentime is excellent. I love the way his belly lights up just before he breathes fire. I think the Legolas fight scenes are excessive but I do enjoy them, and I especially love the way he shows disdain for the dwarves; it adds to the significance of his eventual friendship with Gimli when we get to see more of how he thought of and treated dwarves before the Fellowship quest. My favorite moments with this aspect of Legolas’ character in this film were when he stands on the dwarves’ heads while they race downriver in barrels, because they are so beneath him he sees no problem with literally walking all over him in his goal of fighting orcs, and when Thorin throws a weapon to take out an orc that is coming up behind Legolas, but the elf never turns around to see it, so he’s just going to go on not trusting dwarves for 60 years because he’s unaware that one just saved him. I’m still annoyed that Tauriel is being forced into a love triangle and my eyes almost roll out of my head when she and Kili are talking about starlight while he’s her prisoner or he’s delusional, saying “Tauriel…you cannot be her. She is far far away from me. She walks in starlight in another world. It was just a dream. Do you think she could have loved me?” while his head rests on a bed of walnuts, but, I’m going to try to get over it and appreciate the bits about Tauriel’s character that I did like. I mean she looks fantastic and cool, I like her outfit and her hair and everything. She’s graceful yet deadly, she’s very skilled in battle but not as much of a show-off as Legolas. She’s smarter and more compassionate than Legolas or any of the other elves, too, it appears. And as far as the whole stupid romance aspect, the comic below raises a good point and I will begrudgingly try to just appreciate the Tauriel character without ranting about the stupid romance, (although I whole-heartedly stick to my stance that storytellers should not assume including a female character means that you have to include romance!). Biblo dropping the ring in Mirkwood and fighting the creature (spider? land squid? I don’t know what it’s supposed to be…) to get it back is really good, but then it lingers too long on his reaction after the fact. That’s a problem throughout the film, scenes that linger on for too long. Also it starts to feel like watching a kindergarten program whenever the dwarves trample into the shot together, nobody saying anything distinct and nobody displaying any apparent brains; like, why don’t they just get into the barrels without Thorin having to expressly command it? Why do they just turn and start heading back down the mountain when the sun goes down and they think they’ve missed their chance? Why are they incapable of figuring out that they need to lift the handle to open the door at Beorn’s until Thorin gets there; is it just so we can see them tumble inside in a big heap when the door finally opens? Seriously, kindergarteners. Also, it’s really unclear why Bard is even being chased by the guards that arrest him near the end, and when they do catch him and he says “on what charge? !” they just say “any charge the master chooses,” which I guess is supposed to illustrate the corruption of Laketown’s ruling class but it just feels like laziness on the part of the screenwriters. I would really like to know what the script looked like when they had planned this adaptation to be only two parts. I’ll bet it made a lot more sense. Instead of extended edition DVDs, can we get compressed editions? Ugh, this post turned out to be more negative than I had planned. I’m really not trying to be a Negative Nancy or a Debbie Downer…the movie just isn’t very good. And I’m still bummed about that fact. Me reconciling my dashed hopes and dreams for what this film could have been with the reality of what it is. The melting temperature of iron is about 500 degrees Celsius higher than that of gold, so a regular iron wheelbarrow would work. Heat-transference through the metal to the dwarf riding it is a different matter, though. You’re the second person I’ve seen comparing the film to a video game. I thought the movie was good (though with some faults) until I first read that comparison. Now I’m thinking the film was good if you imagine it’s a video game instead of a film. maybe dwarves can withstand higher temperatures than humans? Perhaps. Or maybe they’re just too stubborn to burn. “(…) they’re just too stubborn to burn.” – This. “maybe dwarves can withstand higher temperatures than humans?” – Probably. Aule created then strong enough to withstand Melkors evils (we should consider the body and the mind here). That desolation of dreams gif expressed exactly how I gutted and betrayed felt after Breaking Dawn 2,how they wrecked my fave chars Aro & Carlisle (still love Peter & Michael though!! – There’s only so much fantastic actors can do with a piss-poor script) Here’s hoping they will remake the all the movies that devastated the fans!